Posted 13 January 2019 in General. Tom Morehouse is one of Jack Kirby’s biggest fans and scholars. He built a significant collection, a.k.a. his Kirby Krypt, which contained every one of Kirby’s U.S. published works (note the past tense, he sold it years ago), and continues to study Kirby’s work. Tom recently reached out and asked “What was the name of the Australian ‘Snake River’ comic, again? Because I think I found it.” I reminded him it was “Showdown at Snake River“, and we talked more. 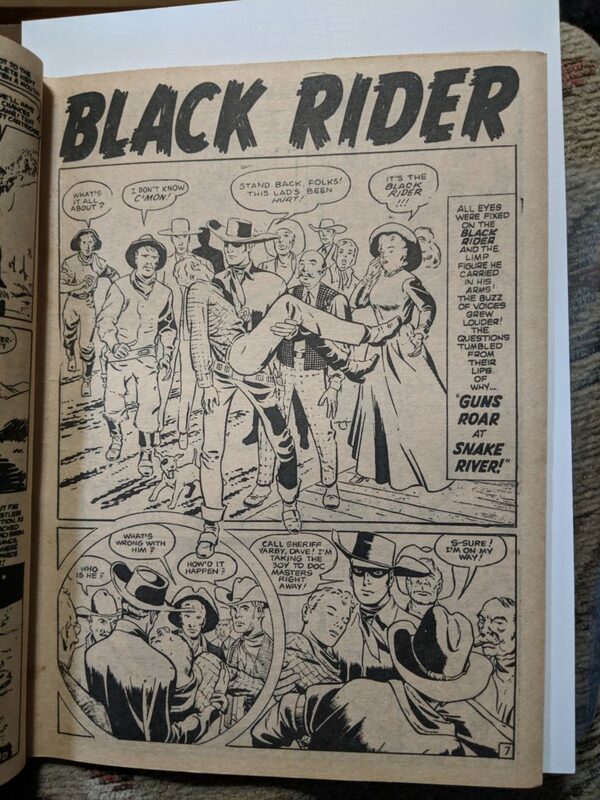 Turns out he’d asked an auction seller about a Black Rider story that was listed in a comic they were selling. They replied it was titled “Guns Roar at Snake River!’ and sent along a low quality snapshot. And there it was. 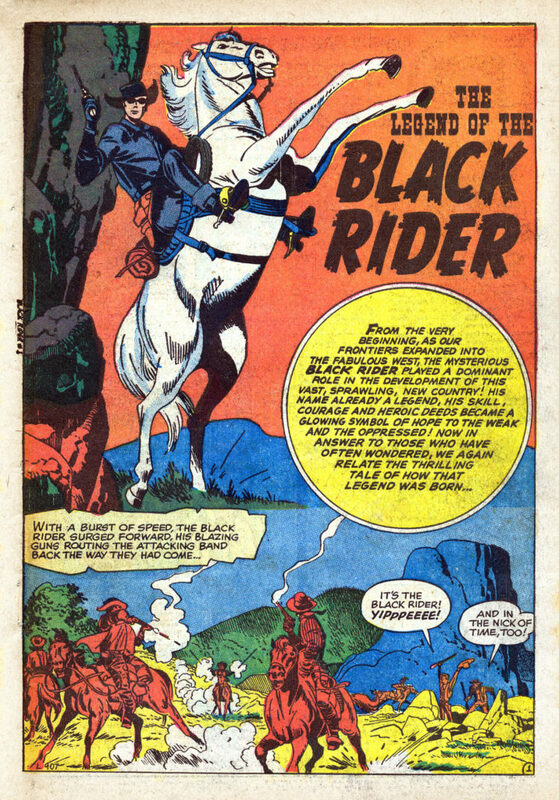 A Kirby splash for a previously unknown Black Rider story! The circular lower left panel was a big clue. 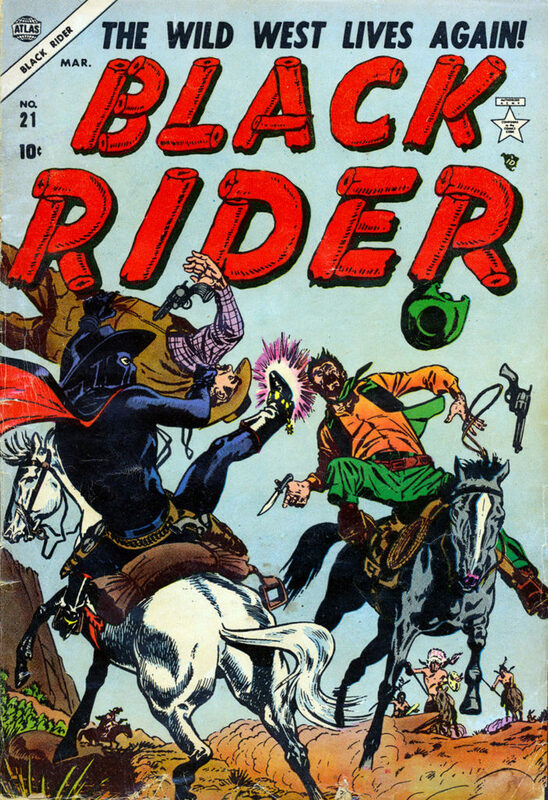 Cover to Black Rider vol 2 #1, dated September 1957. Art by John Severin and color by Stan Goldberg. However, two years later Goodman started a new quarterly Black Rider series, dated September 1957. 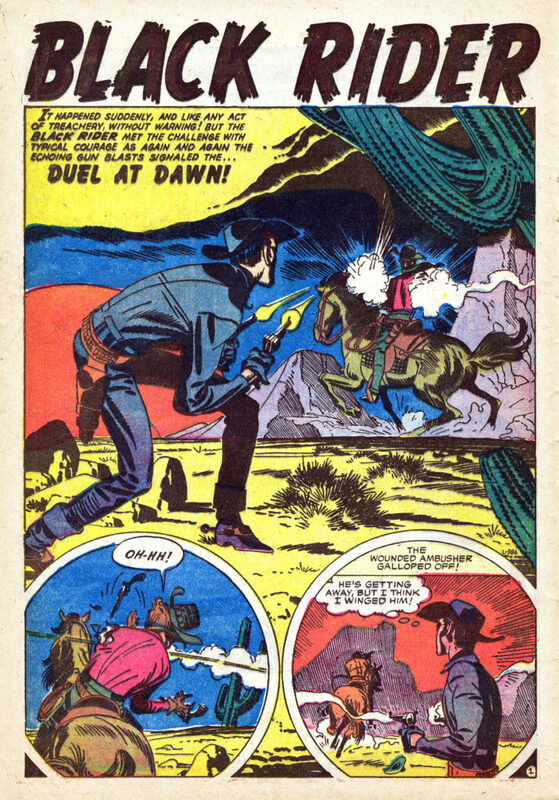 With a beautiful cover by John Severin, the issue contained three Black Rider stories across nineteen pages by Jack Kirby, the seven page “The Legend of the Black Rider!”, the six page “Duel at Dawn”, the six page “Treachery at Hangman’s Bridge!”, a four page story by Bob Powell, and a text story with illustrations by Gene Colan. 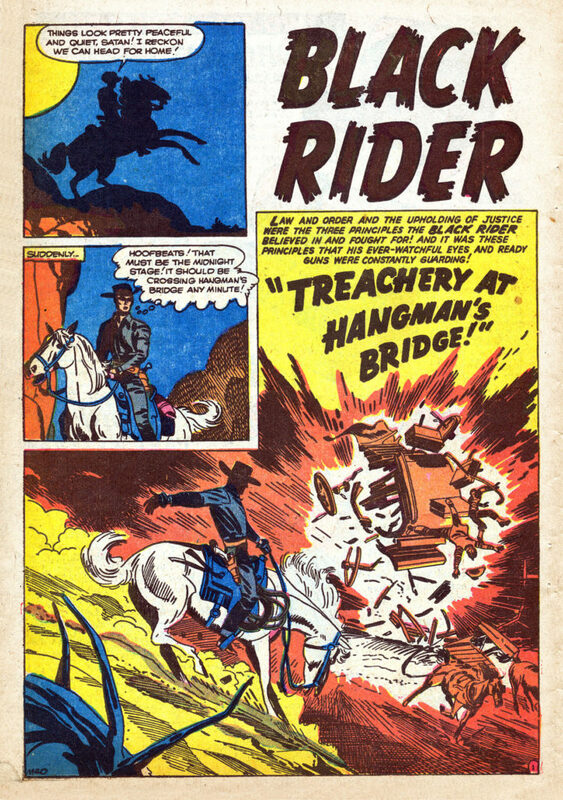 Title splash pages for the three Black Rider stories in vol 2 #1, dated September 1957. 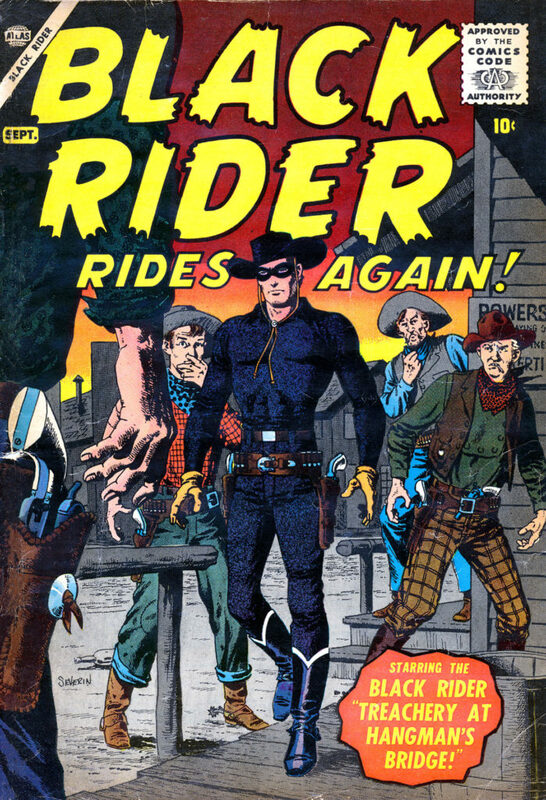 The second issue… well, there was no second issue, but it appears one was planned because Goodman published three more Jack Kirby Black Rider stories totaling fourteen pages. 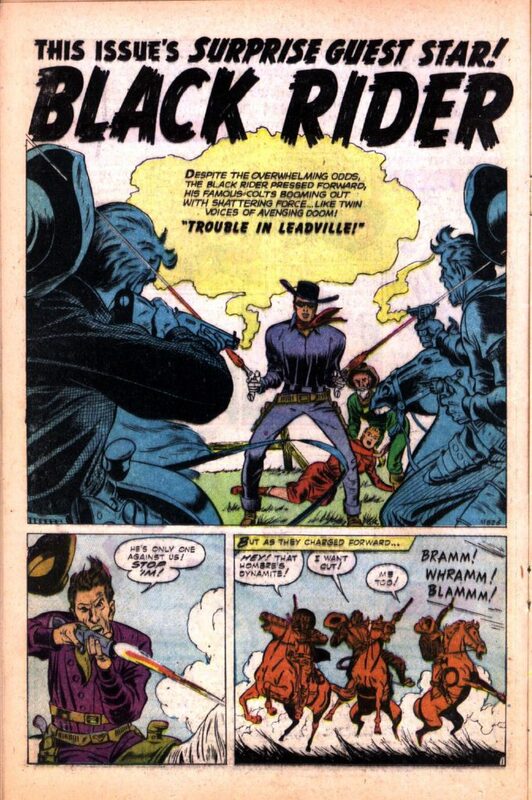 The four page “Trouble in Leadville!” appeared in Gunsmoke Western #47, dated July 1958, the five page “The Raiders Strike!’ appeared in Gunsmoke Western #51, dated March 1959, and the five page “Meeting at Midnight!” appeared in Kid Colt, Outlaw #86, dated September 1959. 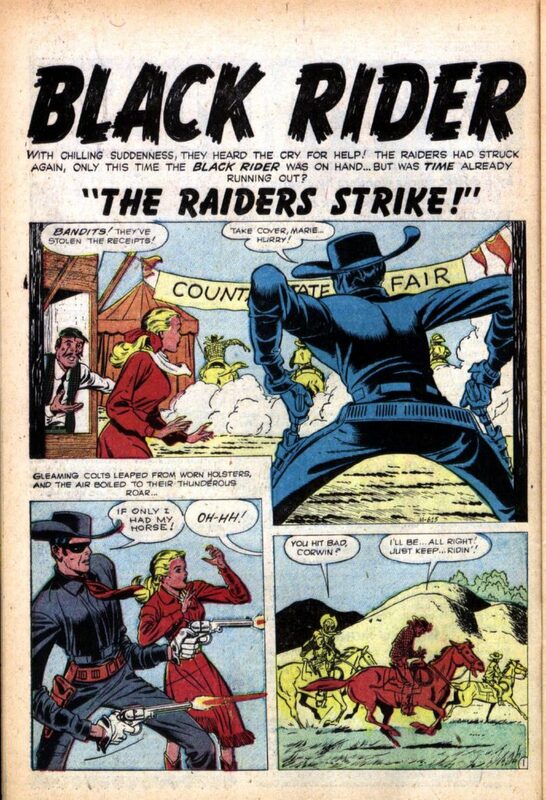 Title splash pages for the three Black Rider stories published later in the U.S..
Tom found the Black Rider “Snake River” story in Giant Western Gunfighters #4, from Horwitz Publishing. After receiving it, he graciously lent it for scanning and indexing. 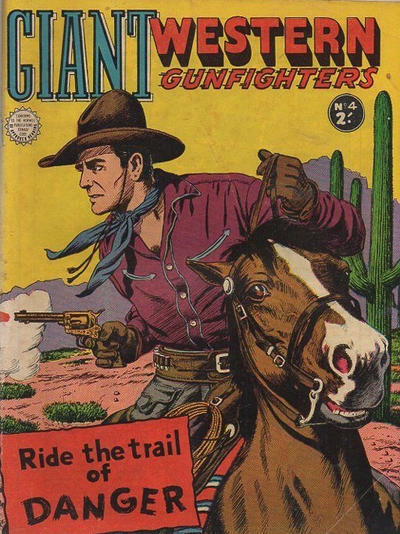 The comic is a mixture of Goodman-published stories, but interestingly, contains five 5 page stories, including the Black Rider, that have not been found to be published in the U.S..
Cover to Giant Western Gunfighters #4. Published by Horwitz publications, 1958. Art by Maurice Bramley. Splash pages to the four other stories that do not appear to have been published in the U.S.
Ok, enough background – here’s the new discovery! Time to call in some art Identifying experts! 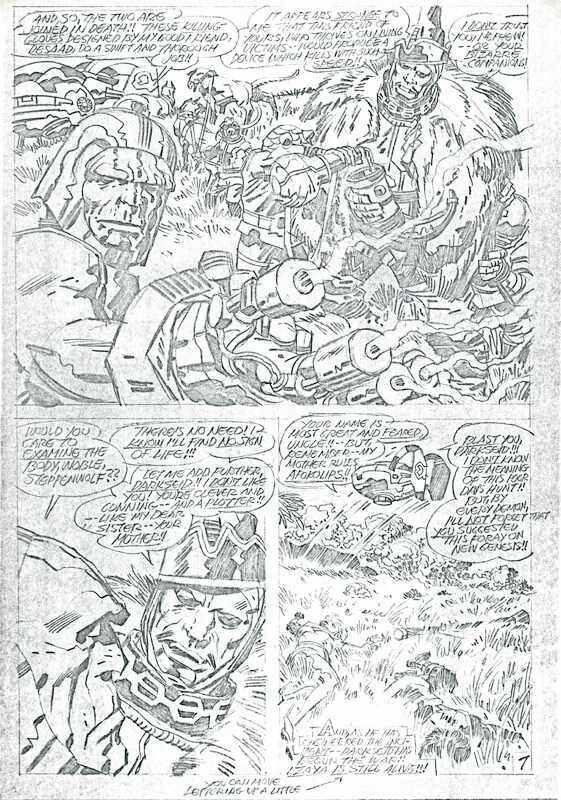 Harry Mendryk, Dr. Michael J. Vassallo, and Nick Caputo all agree that the pencil art is all Kirby, while Doc V. and Nick agree that the inking is by George Klein. The lettering is still in question. Alex Jay suggests Joe Rosen, and Nick Caputo suggests Ray Holloway. If you have any thoughts, please share! 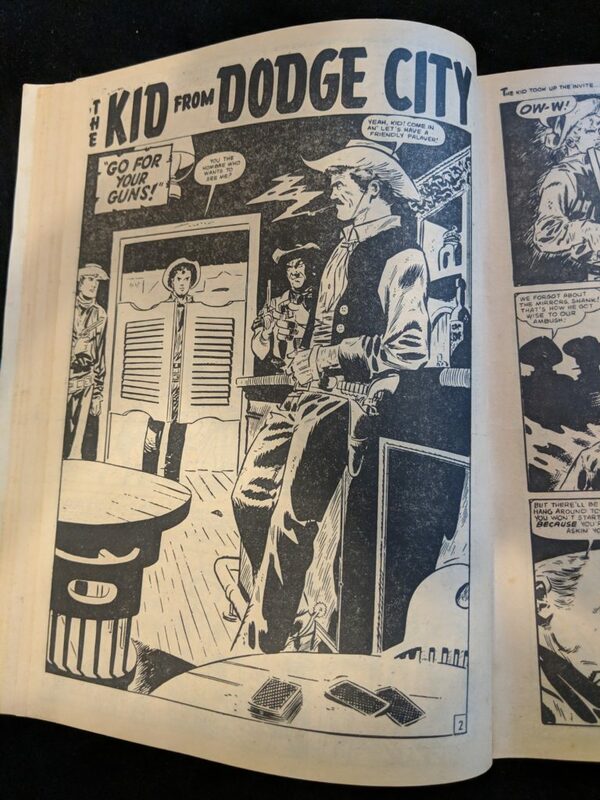 It’s somewhat interesting that two recent Kirby western story discoveries have “Snake River” in the title, and are inked by George Klein, who is now acknowledged as the inker of Fantastic Four #1. Quite a coincidence that Kirby sold both Snake River stories to Goodman’s editor Stan Lee, but neither were published in the US. A hearty hail of gratitude to Tom Morehouse for continuing to do the deep dive! And many thanks to Harry, Nick, Doc V., and Alex for their help. Davy Crockett, Frontiersman: Hiding In Plain Sight! Posted 6 February 2018 in General. 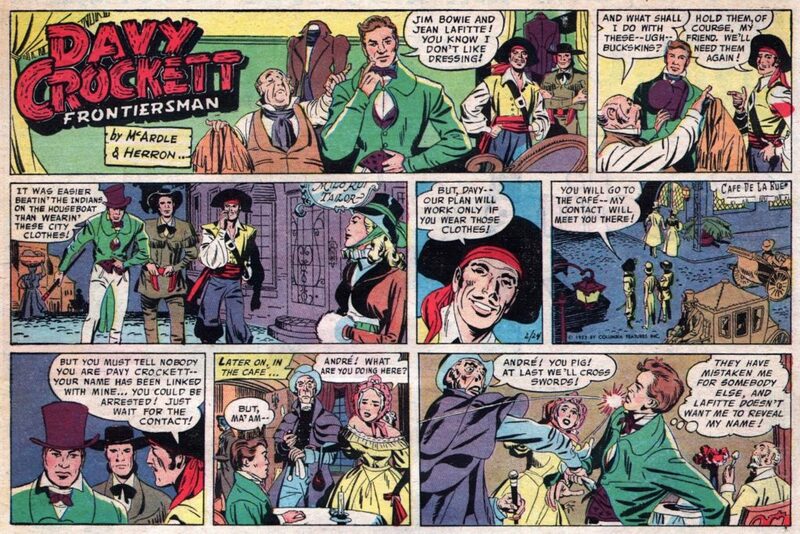 In August of 2012, we published a re-worked translation of Jean Depelley’s article about Jack Kirby’s ghosting of the Davy Crockett, Frontiersman comic strip. 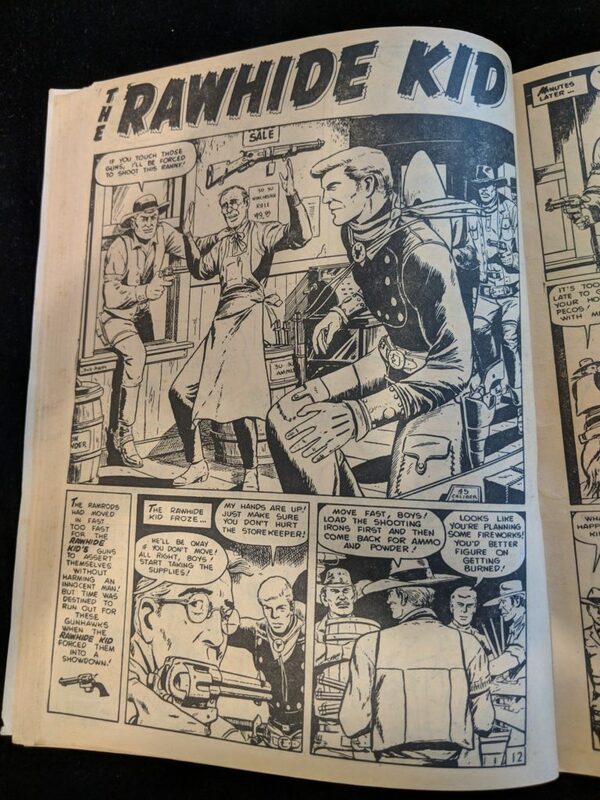 What was notable about the article, originally published in French earlier that March, was that Jean and Bernard Joubert found evidence that the work was, in fact, a comic strip reworked to comic book size in Marvelman (UK) , and digest size in Zoom (France). 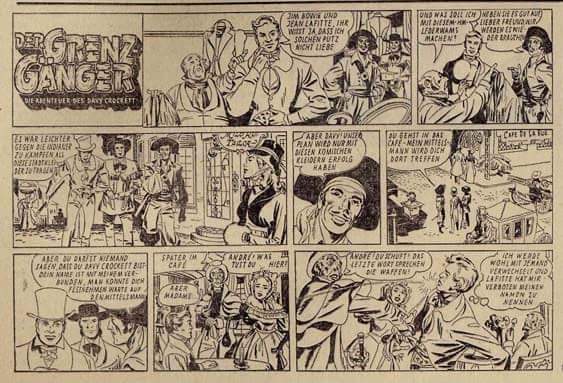 Since then, Hans Kiesel sent the Museum an email in late 2015, letting us know that he and fellow comics researchers in Germany found a Crockett Sunday strip in black and white translated into German that was obviously by Kirby. Hans also included a mention from Allan Holtz’ Strippers Guide stating that Kirby had ghosted two Sundays. 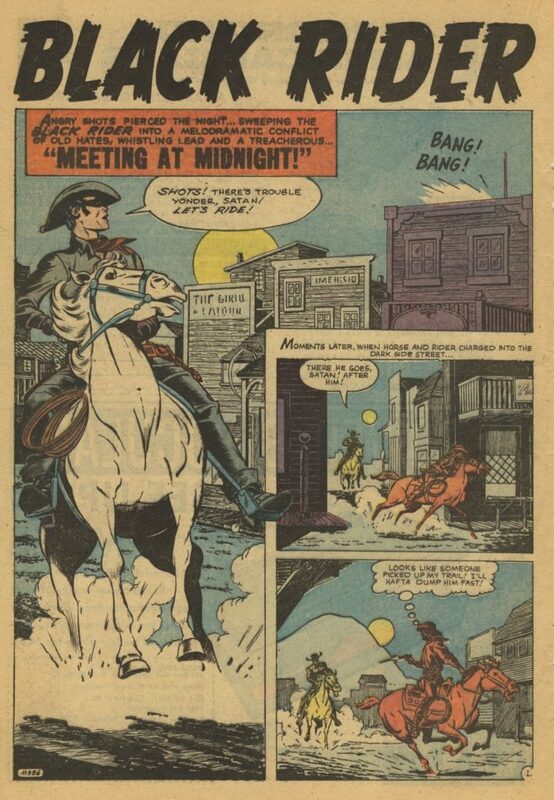 I continued, on-and-off, researching the strip, along with Kirby’s Blue Beetle daily strips in the 1940s, on the internet without any results regarding Davy Crockett. The Kirby Museum has had a pleasant relationship with collector, scholar and collage artist Tom Morehouse since our formation in 2005. 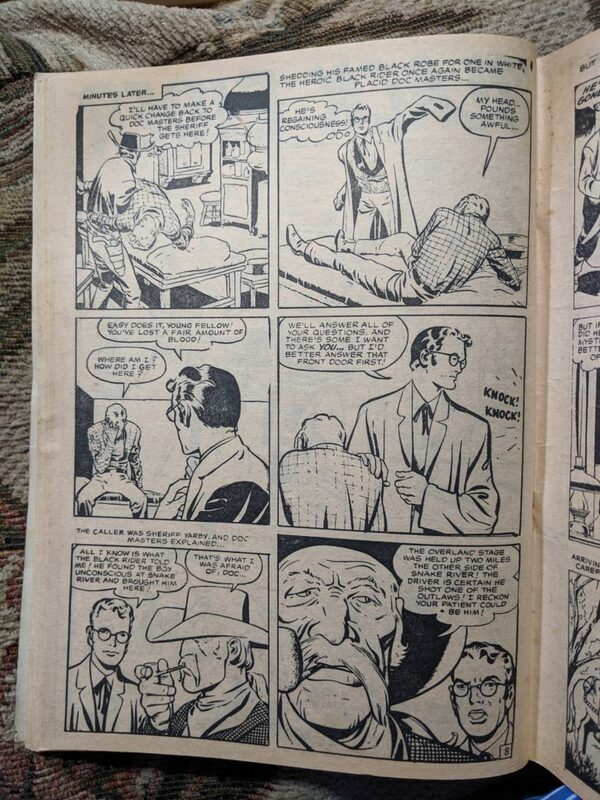 In fact, Tom allowed us to scan his copies of the Crockett reprints in Marvelman in 2011 (see above). Since I’m comfortable researching newspaper microfilm at the New York Public Library – you know, the big one with the lions in front on 42nd St. & 5th Ave – Tom suggested we go there together and look at the Daily News microfilm. And, voila! Kirby ghosted three weeks of daily strips from January 14th through February 2nd. But what about that other Sunday strip? 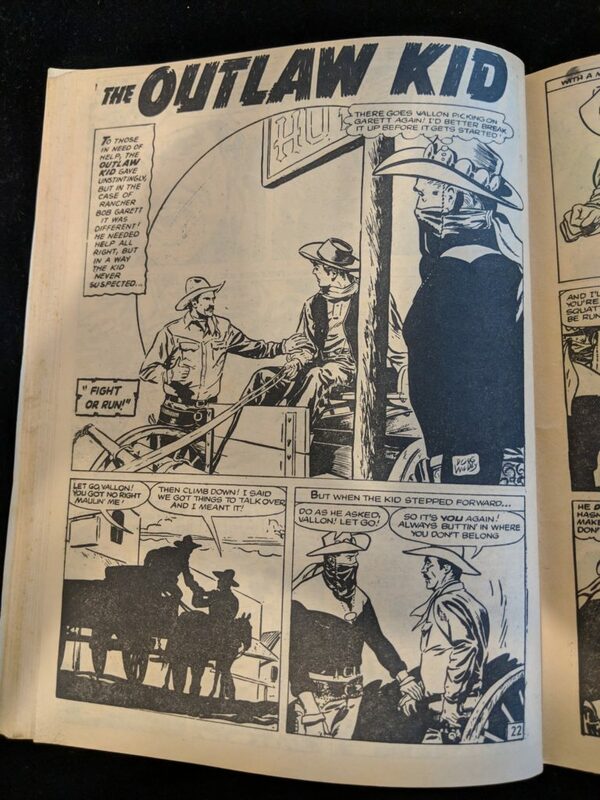 Well, on one of the Facebook comics groups where Doc V. shared his discovery, Mark Evanier mentioned that the Billy Ireland Cartoon Library & Museum has a large collection of comic strips. I dove into their search engine, and found that they did, indeed, have both Sunday strips, courtesy of the San Francisco Academy of Comic Art Collection of Bill Blackbeard. And, it seems it is complete: three weeks of dailies, and two color Sundays. It wouldn’t be right to end this article without mentioning Matthew Gore. You see, Matt posted Crockett scans from Marvelman #231 on his website all the way back in 2002! Can anyone provide reasonable guesses when the Marvelman issues 231, 232 & 233 were published? Seems that information is currently unavailable. Hopefully, I’ll provide some comparisons between the versions, showing how the art was extended for the different formats in France and the UK. Posted 28 August 2017 in General. In August of 1917, Rose and Ben Kurtzberg, two immigrants from Galicia in what what is now Poland welcomed their first born, Jacob. In the early 20th century, New York City’s Lower East Side was the most densely populated two square miles on the planet. Ben sewed pants in sweatshops. Rose did piecework at home when not raising her sons. Lower East Side kids played in the streets, and fighting was a favorite pastime. Kirby’s gang, the Jewish kids of Suffolk St. would take on the Italian kids from another block, or the African-American kids from yet another block. Jake was small in stature, and once had to rescue his younger brother David from an attack by a rival gang. Jake recalled it happening in slow-motion, as if choreographing the whole fight in his head. Jake loved fighting so much that he once took a long subway trip to the Bronx to see if they fought any differently there. Rose’s extended family were storytellers. Jake grew up hearing stories about demi-gods, werewolves, and vampires, learning about them long before they appeared in the movie theaters that were everywhere on the Lower East Side. At 14 Jake found a science fiction pulp magazine in a rain drenched gutter. The image on the cover changed him forever. He took the magazine home, read it, and it fueled his interest in drawing. The stories in the magazine reminded him of the tales his mother and her friends told, but with new, hopeful, futuristic trappings. He began reading as much as he could, something he had to hide from his buddies, and took how-to-draw books out from the library. Jake met his “second father” Harry Slonaker around this time. Slonaker graduated from the Boys’ Brotherhood Republic in Chicago and was assigned to New York City to start one there. The BBR helped boys in the worst neighborhoods learn responsibility and useful skills, and it had its own rules, government, and even media. Jake took up boxing and became the cartoonist on the BBR newspaper, which he signed with the name “Jack”. While Jack’s mother wasn’t going to let him follow neighborhood hero, actor John Garfield (nee Jacob Garfinkle), to Hollywood, his time as an office boy in a newspaper cartoonist’s office showed him there was another way out of the ghetto. Most of his pals saw careers as policemen, a politicians, or gangsters in their future. Jack stayed less than a week in an art class at the Pratt Institute. Not only wasn’t he the kind of artist they wanted – he worked fast – but his father lost his job, and Jack dropped out of school entirely to find work. After a brief stint as a newsboy, Jack found work at the Fleischer Brothers animation studio, working on Popeye and Betty Boop cartoons as an inbetweener, filling in the necessary number of drawings to complete the illusion of movement. Jack’s steady work allowed the Kurtzbergs to move from the Lower East Side to Brooklyn. Jack’s time with the Fleischers was short lived. The environment reminded him too much of the sweatshops where his father worked, and the studio was relocating to Florida. He found work with some small newspaper syndicates, preparing his strips (Socko The Seadog, Your Health Comes First) at home on the kitchen table. One series, “The Romance Of Money” didn’t get syndicated, but was collected as a small pamphlet for savings banks as a giveaway. Arguably, The Romance Of Money is Jack’s first comic book. With the success of Superman in 1938, there was a tremendous demand for new, original comic book content. Jack found his way to the Eisner-Iger Studio, preparing stories in a similar fashion to the single pages appearing in Sunday newspapers. Soon, he and his boss Will Eisner realized they were working in an entirely new, multi page art form. Eisner recalled one incident where Jack got in the faces of mobsters who were shaking down the studio for a towel service payment. The goons left. Jack soon left Fox to work with Simon exclusively, and moved his family to a nicer apartment in Brooklyn. There, he met his upstairs neighbor, and future wife, Rosalind Goldstein. Simon & Kirby produced Captain America, and the first cover featured the patriotic hero punching Adolf Hitler in the face. Published in late 1940, a year before the U.S.A. entered the war, the cover was a stark declaration of intent, and the book was a smash hit. Kirby’s choreographed action sequences were a main selling point. At one point, the Nazi-sympathizing group the American Bund were making threatening phone calls to the Simon & Kirby team. When they called again, Kirby went downstairs to confront them, but they weren’t there. Also for Goodman, they took two superhero sidekicks, Bucky and Toro, teamed them with four non-super-powered kids and created the Young Allies, the first kid gang. While still on staff at Timely, Kirby, Simon, and several inkers produced Captain Marvel Adventures #1 for Fawcett, uncredited, over a weekend. It became one of the top sellers of its time. 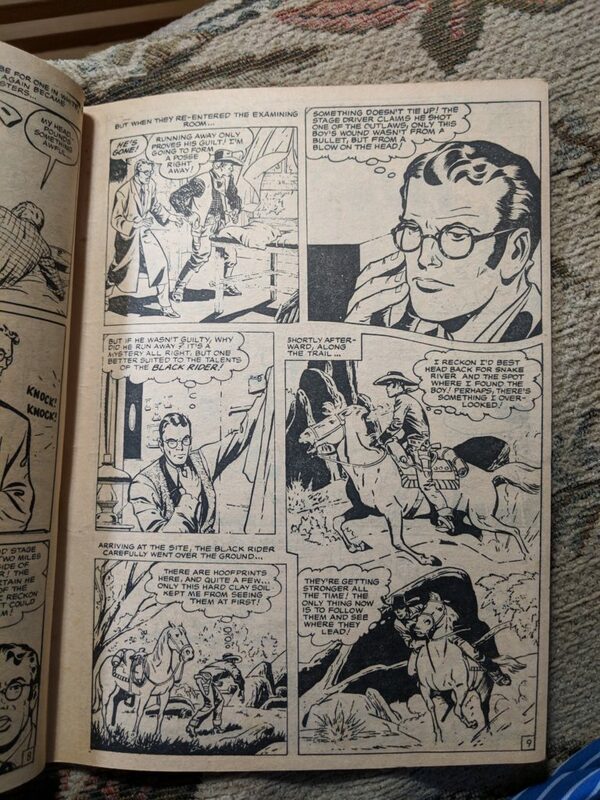 The Simon & Kirby team had such success with Captain America and their Captain Marvel one-shot that when they discovered Goodman wasn’t paying them the agreed percentage of revenue, they quickly moved to National Comics, home of Superman. They revamped existing features Sandman and Manhunter, while Kirby’s youth inspired them to create the Boy Commandos and the Newsboy Legion. In 1942, the bickering Boy Commandos received their own title which was only outsold by National’s Superman and Batman comics. That same year, Jacob Kurtzberg legally changed his name to Jack Kirby, and married Rosalind. In the midst of this success, World War II was looming. Jack was drafted into the infantry in June of 1943. In August 1944, Kirby arrived in Normandy, France and was sent to Verdun to join General Patton’s Army on its rapid offensive eastward. His division was sent to south of Metz to rid the area of German resistance. Taking advantage of Kirby’s drawing skill and his knowledge of the German dialect Yiddish, Kirby’s commander sent him into enemy territory to scout and draw up detailed maps. Kirby’s war experiences were more brutal, horrifying, and violent than anything he experienced on the mean streets of the Lower East Side. His time in combat had a profound effect on him. Since storytelling was such a part of his personality, he shared war stories for the rest of his life. Eventually, Kirby contracted trench foot, and nearly needed both feet amputated. Thankfully, that didn’t happen. Roz, at least, expressed that losing his drawing hand would have been much worse. In January 1945, Kirby made his way back stateside to North Carolina and was honorably discharged in July with several honors including the Bronze Battle Star. In December 1945, Roz and Jack’s first child, Susan, was born. With the war behind them, the Simon & Kirby team got back to work, producing the short-lived Stuntman and Boy Explorers for Al Harvey. But action heroes and kid gangs didn’t sell like they used to. Comic books had been popular with soldiers overseas, but now that they were home, they had more reading choices. By 1947, the team was trying their hand at other genres; crime comics, funny animals, and teen humor. “True Romance” pulp magazines had been selling well to both teen and adult women for a while, so through Crestwood/Prize, Simon & Kirby’s Young Romance, the first romance comic, debuted that summer to great success. After two lucrative years producing romance comics and with growing families, the Kirbys and the Simons moved into houses across the street from each other in the suburbs of Long Island’s Nassau County. In 1953, Simon & Kirby started their own publishing company – Mainline Comics. Unfortunately, the corrupt newsstand business was collapsing, and social forces that had been building for years came to a head with the publication of Fredric Wertham’s book, Seduction Of The Innocent, which claimed comic books were corrupting America’s children. Subsequently, horror and crime comics were chased off the market, and comic book creators were stigmatized. Comic book quality experienced a sharp decline, with all offerings assuredly safe for the youngest kids. Eventually, Joe Simon left the team for more lucrative and secure work in advertising and marketing for political campaigns. Kirby brought the team’s Challengers of the Unknown to National (DC), and started working for Goodman (Atlas) again. He also worked up a number of comic strip proposals. Eventually, through a connection made by Jack Schiff, an editor at DC, Kirby, with writers Ed and Dave Wood, began a newspaper strip that capitalized on the nascent space race, Sky Masters Of The Space Force. 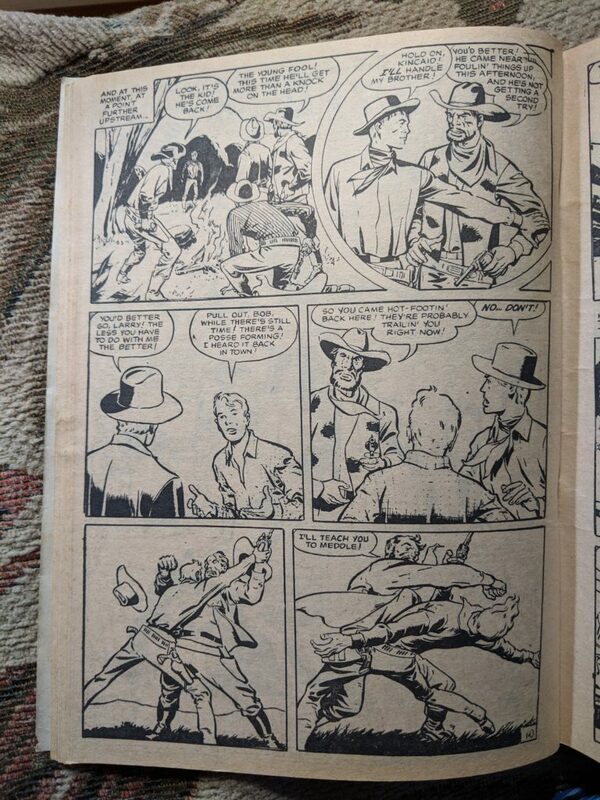 With inking by Wallace Wood, the strips were beautiful. Unfortunately, due to a misunderstanding of the financial arrangement with Schiff, and what Schiff felt was Kirby’s using ideas from story conferences for Challengers Of The Unknown in Sky Masters, Schiff sued Kirby. Kirby lost. He continued the strip for a while, but the financial arrangement made it a losing proposition, so he quit. He’d also lost DC as a client. Jack soon found more work under Atlas editor Stan Lee, mostly on monster and science fiction stories. Simon and Kirby teamed up briefly at Archie Comics on The Double Life of Private Strong and The Adventures of the Fly. 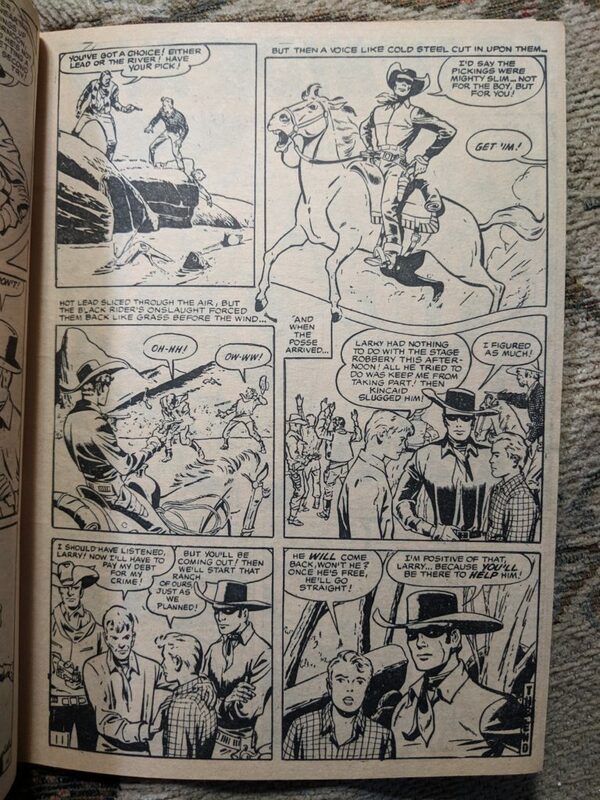 Kirby even worked briefly for Classics Illustrated. Inspired by his success with starting Challengers Of The Unknown at DC, the slight success of the Archie heroes, and his son Neal’s interests, Kirby felt the time was again ripe for superheroes. Soon enough, Goodman and Lee saw what was happening at DC with the Justice League of America, and decided that Kirby was right. 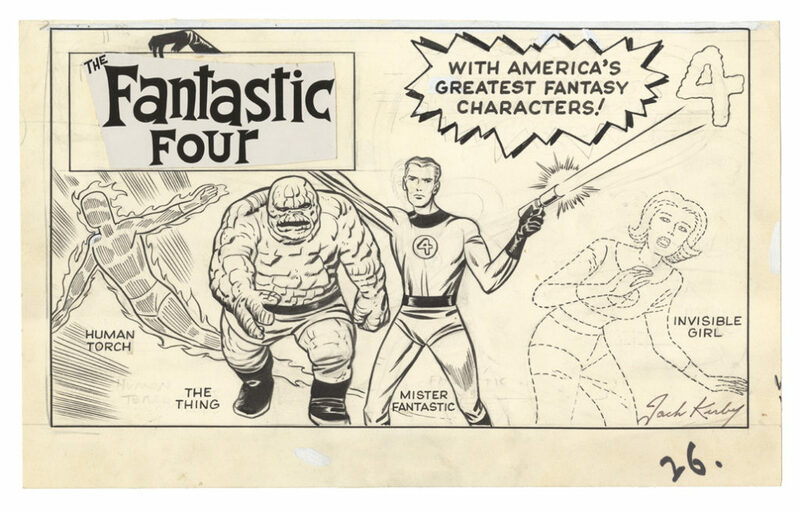 Lee had Kirby take one of his monster stories featuring some adventurers, and give them superpowers. 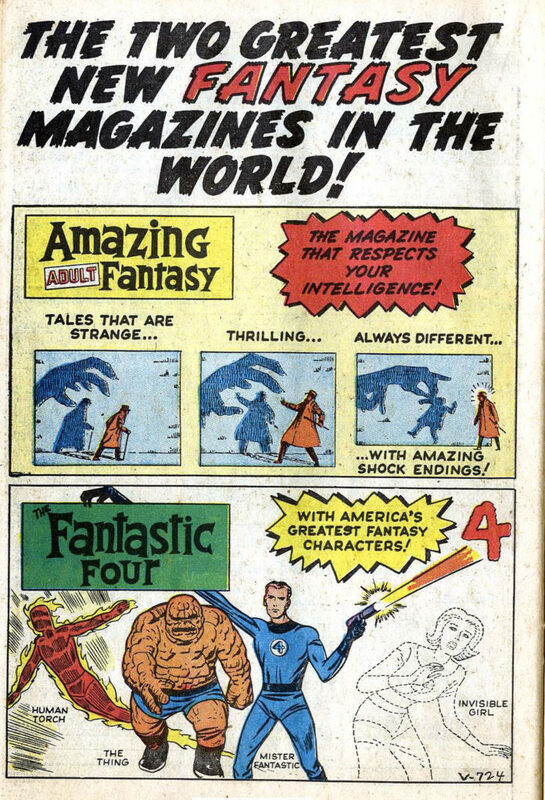 Thus was born Marvel Comics as we know it, with The Fantastic Four. Kirby’s vivid imagination, his heartfelt humanity, his love of science fiction and mythology, and his amazing dynamic visual storytelling all coalesced in his work for Lee and Marvel when he was in his 40s. Kirby continued to pitch heroes. Lee had been publishing monster comics, so how about a monster as a lead character, the Hulk? A scientist from a previous story became Ant-Man. Mythology was one of Kirby’s favorites, so Norse god Thor came next. An urban hero who walked on walls came next, with Kirby bringing in a logo from the Simon & Kirby studio days in the early 1950s – Spiderman. Steve Ditko ended up with the assignment. Next came Iron Man, with the origin drawn by Don Heck; Sgt. Fury and His Howling Commandos, a grown up Boy Commandos; X-Men, a science fiction-based kid gang; and the Avengers, a bickering group of adult heroes. Kirby even had a hand in the creation of Daredevil, evoking his earlier Stuntman. In response to the assassination of President Kennedy, Lee and Kirby revived Captain America. Marvel’s sales picked up. 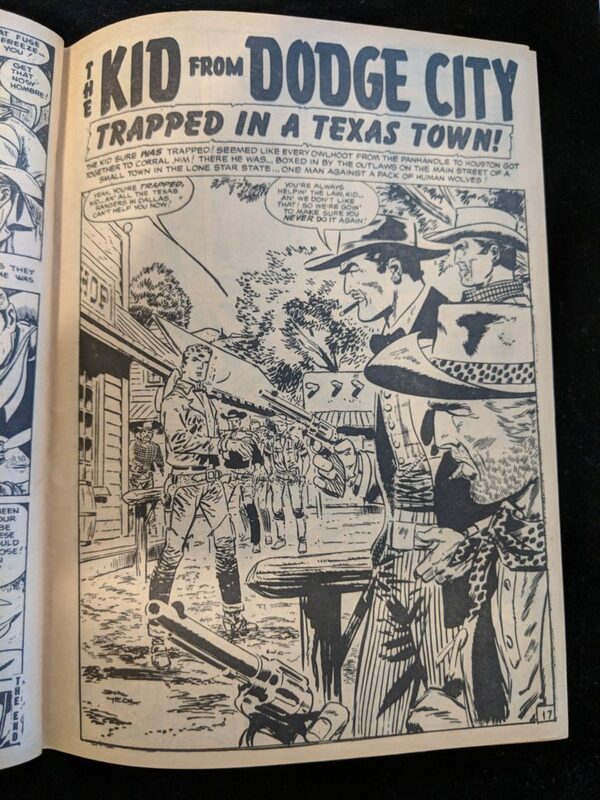 Lee’s snappy dialogue combined with Kirby’s stories, as well as the familiar, fan club-like tone of Marvel’s editorial copy kept the baby boomers reading comics into their teens and college years. Soon, Kirby was producing so many stories for Lee, that it became more expedient to eschew story conferences before the art was drawn. They’d briefly discuss the next issue, and Kirby would return with a fully drawn story, and describe to Lee what was happening. 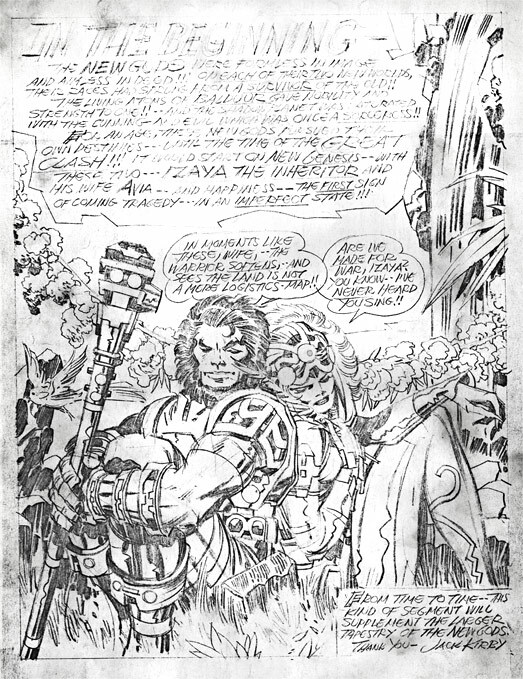 When even this became too time consuming, Kirby would include story notes on the edges of his artwork for Lee to use while preparing the dialogue script for the letterer. In one notable example, Lee and Kirby had discussed having the antagonist be “The Big G” – a euphemism for God. Kirby knew that such a powerful, threatening force would be preceded by… a scout, whom he cosmically depicted as a surfer of the spaceways. Lee loved Kirby’s new character, and dubbed him the Silver Surfer. Audiences’ minds were blown. Goodman started licensing Marvel characters out, which led to Steve Ditko’s departure since Goodman wasn’t including him in licensing revenue. As a result, Lee tried to strengthen his relationship with Kirby, agreeing to a profile of he and Kirby by the NY Herald-Tribune. Unfortunately, the profile failed. The writer admired Lee’s P.T. Barnum-like chicanery, and denigrated Kirby’s appearance and manner. Upset, Kirby kept producing stories and characters for Lee, but not for long. 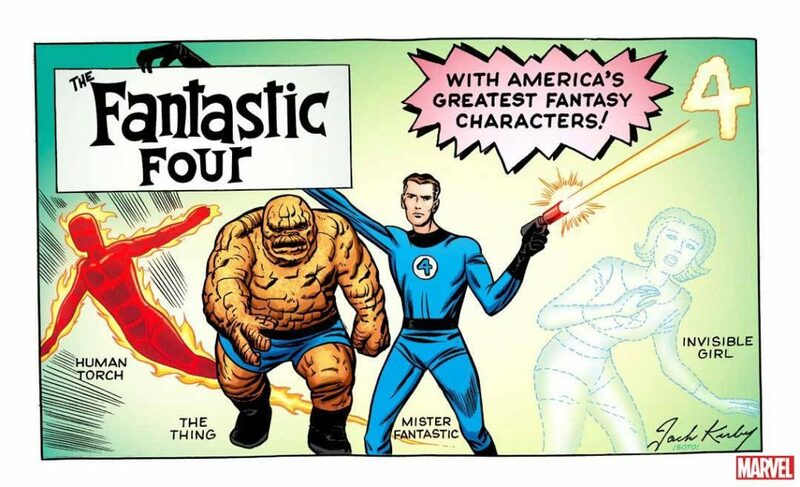 On one Fantastic Four story where Kirby introduced a new character, Him, Lee ignored the notes, and changed Kirby’s theme. After that, Kirby only delivered stories containing already existing characters. Kirby couldn’t stop creating new concepts, though. He just kept them to himself. When Goodman sold Marvel to Perfect Film, a more corporate entity, Kirby was stung by the new owner not wanting to negotiate a contract. Kirby felt the need to break out of his situation, so he moved his family to Southern California and began talking to Carmine Infantino at DC. Infantino, a long ago Kirby protege who had successfully updated Batman for the readers brought in by the TV show, was rising in the editorial ranks. For DC to have an artist in the editorial office was unprecedented, and Infantino was looking to innovate. Once Jack Schiff retired, Infantino was free to bring Kirby aboard. Infantino had wanted Kirby to revamp Superman, but Kirby only took on the Jimmy Olsen series, adding an updated Newsboy Legion to the cast (Olsen was a newsboy, after all). 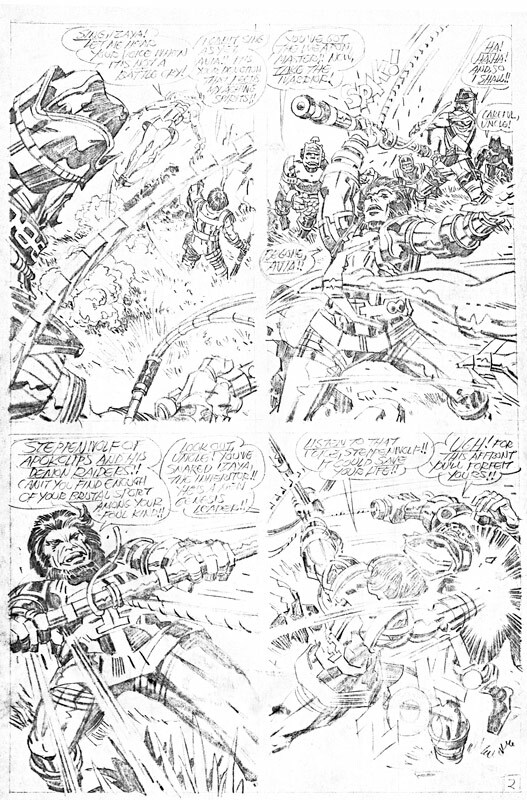 Kirby pitched a new science fiction mythology that filled three ongoing series, but unlike his time at Marvel, he retained creative and editorial control, eventually bringing in California resident Mike Royer to provide inking and lettering. The New Gods, Mister Miracle, and the Forever People, his “Fourth World” comics, were unfettered Kirby at the top of his game, making comics for everyone, not just kids or teenagers. Unfortunately, the newsstand business was still corrupt, with distributors selling fan favorite comics like Kirby’s to comic dealers to sell at conventions without reporting those sales to the publishers. As a result, the sales reports for Kirby’s comics were disappointing. Infantino then asked Kirby for a horror comic, like the movies that were then in vogue, and a kids comic to capture the popularity of the Planet Of The Apes movie series. Jack delivered The Demon and Kamandi, The Last Boy On Earth. Kamandi became Jack’s longest running series for DC. But as the end of his DC contract neared, Kirby was unsatisfied with his prospects there. In 1976, Kirby returned to Marvel and Captain America. He also created the Eternals, Machine Man, the Black Panther, Devil Dinosaur, and an adaptation of 2001: A Space Odyssey. At the end of his two year deal, he worked with Lee on a Silver Surfer graphic novel in the hopes it would be turned into a rock musical movie. At this point. Kirby had enough of comic books, and found work in the production of television cartoons for children. 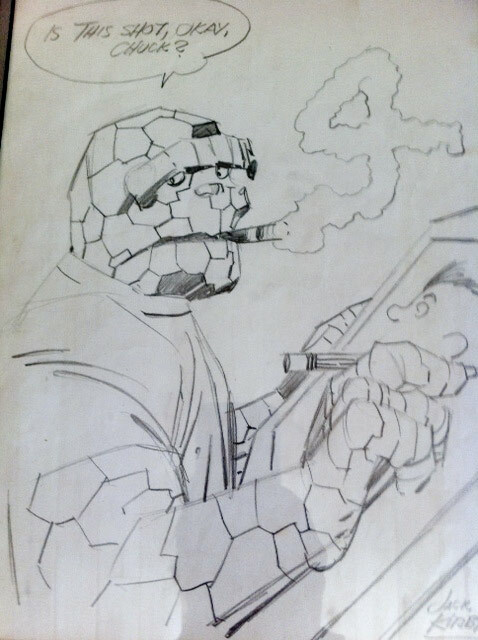 He finished his contract with Marvel by storyboarding Fantastic Four cartoons. He designed characters, props, and situations for Ruby-Spears, sometimes for existing shows like the Kamandi-like Thundarr The Barbarian, but mostly for presentation pitches for new shows. Kirby made some of the best income of his life, and for the first time, even had health insurance benefits. In 1981, Kirby returned to comic books with the first issue of Captain Victory And The Galactic Rangers. Published by Pacific Comics, Captain Victory and Silver Star were the first Kirby comics that bypassed newsstands for the comic book “Direct Market”. In 1983, while having a dinner with publisher Richard Kyle, Roz encouraged Kirby to change the subject from WW2, and tell a story about growing up on the Lower East Side. Kyle commissioned Kirby to draw “Street Code”, Kirby’s only explicitly autobiographical work. To raise money for writer Steve Gerber’s lawsuit against Marvel over the rights to Howard The Duck, Kirby drew Gerber’s Destroyer Duck story pro bono. The comic was so successful, Kirby and Gerber would produce four more issues. 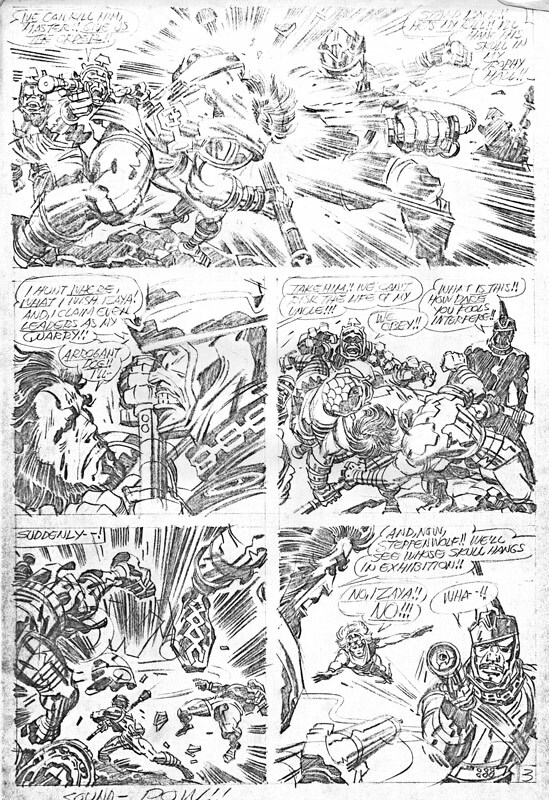 After the last issues of Captain Victory and Silver Star, Kirby returned to DC to provide covers and editorial material for a new edition of New Gods. Among other things, he also produced the graphic novel The Hunger Dogs, bringing his Fourth World saga to a close. In 1984, the comics publishers were realizing that it was in their best interest to return the original art they had been warehousing for years to the artists. Marvel sent a brief release for the artwork to all the artists except Kirby. To him, they sent a four page document with excessive stipulations. Kirby tried to negotiate, but to no avail. His situation gained serious notice in the comics community, who put significant pressure on Marvel to return Kirby’s art as they had to other artists. In 1987 Marvel complied. Jack and Roz celebrated their 50th anniversary in 1992 surrounded by family and friends. Kirby died the morning of February 6th, 1994 in his hilltop home in Thousand Oaks, California. All this time, throughout their life together, Jack and Roz attended comic book conventions and welcomed fans into their home. They loved their fellow fans of comics, science fiction, mythology, romance, and action, encouraged them to live their own lives to the fullest, and to tell their own stories. The high profile of comics in our culture today is a testament to the Kirbys’ positive energy, love, and commitment. Posted 29 June 2016 in General. 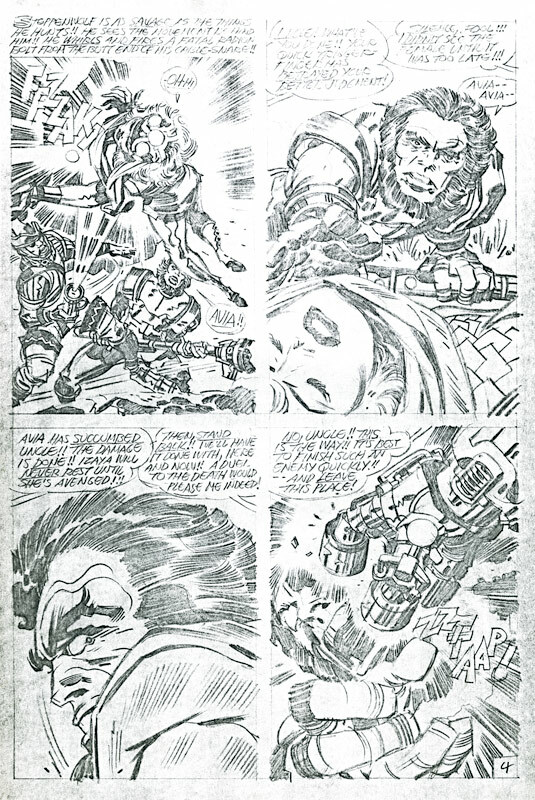 Below are adjusted scans of photocopies taken in the Kirby home of Jack Kirby’s pencil script and art containing the first appearance of Darkseid’s uncle, Steppenwolf. There he is in the first, upper left panel of page 2 of “The Pact!”, Kirby’s epic Fourth World/New Gods backstory published in New Gods #7. Steppenwolf attacks Izaya (a.k.a. High Father) and Avia in a moment of peace on New Genesis. Trouble ensues. Posted 2 June 2015 in General. For most Americans of a certain age, the summer of 1968 is viewed as a kind of dark chasm that yawned between the Summer of Love and the Summer of Woodstock. It was, after all, the summer of Martin, the summer of Bobby. Of My Lai and Biafra. It marked the rise of Nixon and the fall of Prague Spring. It hosted the Chicago Convention. For me, the dog days of 1968 evoke different memories, fonder memories, and none more enduring than the memory of my improbable audience with the King. Iron Man, X-Men, the Incredible Hulk, the Fantastic Four. It was these Ektachrome heroes of today’s CG cinema who formed the warp and weft of my boyhood narrative, their parallel universe of lantern-jawed heroes, buxom damsels and, of course, evil villains bent on world conquest the golden latchkey for a yearning pre-teen fettered to the terrestrial orthodoxy of 1960’s Levittown. Captain America, the Avengers, the Mighty Thor, the Silver Surfer. Conflicted but righteous, misunderstood yet unerring, they and countless other pulp paladins all sprung fully-formed from the sharpened No. 2 pencil of one man, who today is acknowledged, posthumously, as the greatest pencil artist in comic book history. I’m speaking now of the King of Comics, Jack Kirby. And all I wanted was his autograph. 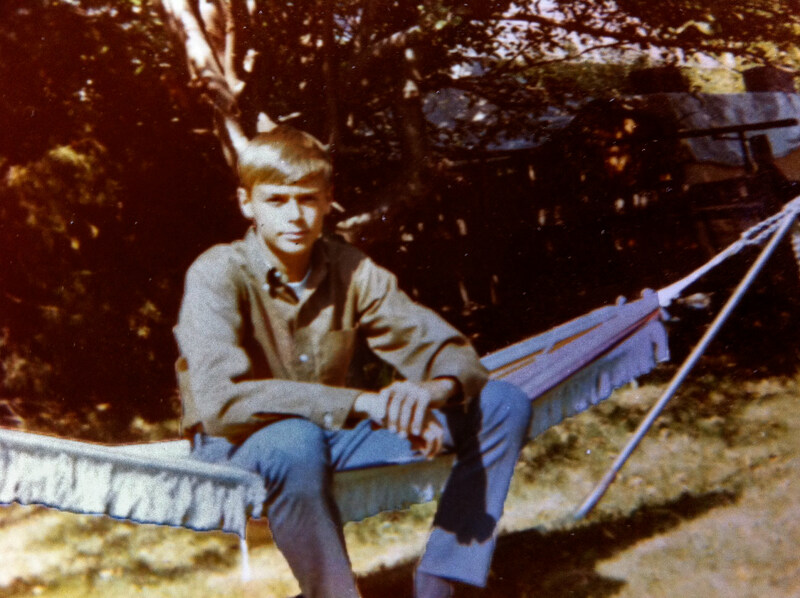 It was in 1968, that tumultuous summer of my twelfth year, that my pal Jimmy and I hauled out the Nassau County phone book and started paging through the K’s. We’d reasoned that if Marvel Comics was headquartered on Madison Avenue, then some of the artists must surely ride the Long Island Railroad to work just like our fathers. Just like ordinary mortals. We found several possibilities — Johns, Jacks and J’s — and I wrote to all of them, effusive in my adulation, and humble, or so I’d hoped, in my request for a signed photograph. I posted the letters and waited. A week passed, two weeks. My attention, meanwhile, had wandered to the more prosaic diversions of a Levittown summer. The Village Green swimming pool. Curb-ball. Ringalevio. The not-yet-amazin’ Mets. And then, all but forgotten, it suddenly arrived — a stiff manila envelope with artful block lettering. Inside was no photograph, however, but an original pencil drawing. The Thing, his arms bulging beneath a tight t-shirt, hunched over a drafting table, a word balloon suspended over his rocky brow. “Is this shot okay, Chuck?” he asked, the smoke from his stogie curled upward to form the magical number 4. A pencilled Jack Kirby Thing self-portrait sent to Chuck Greaves in 1968. Snapshot of the art in frame behind glass. Jimmy was jealous. Jimmy was, in fact, beside himself. And Jimmy had a plan. Over the phone, Mr. Kirby was gracious. Yes, he worked from his home. No, he enjoyed having visitors. Tomorrow? Sure, not a problem. We lied to our parents, naturally, and set out after breakfast on our Sting-Rays for what would prove to be a half-day’s ride into uncharted territory. A suburban neighborhood, a modest home. We knocked. We waited. And Jack Kirby answered the door. He was friendly, avuncular. 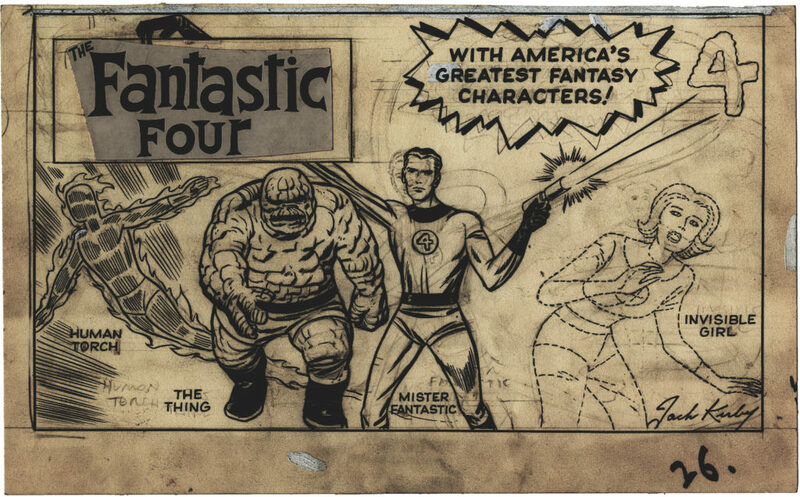 He offered us Orange Crush and led us downstairs to the basement studio where he’d been working on a forthcoming issue of the Fantastic Four. The room was littered with monochrome panels of mutants and monsters, machinery and mayhem. We watched him work. He patiently answered all of our inane questions. We hung. And in the end, after we’d wrung the last drops from our soda bottles, he offered to draw a picture for each of us. My favorite that week was T’Challa, the Black Panther, Marvel’s first-ever African-American superhero, yet another of Kirby’s pioneering creations. He seemed surprised by my choice, and somehow pleased. 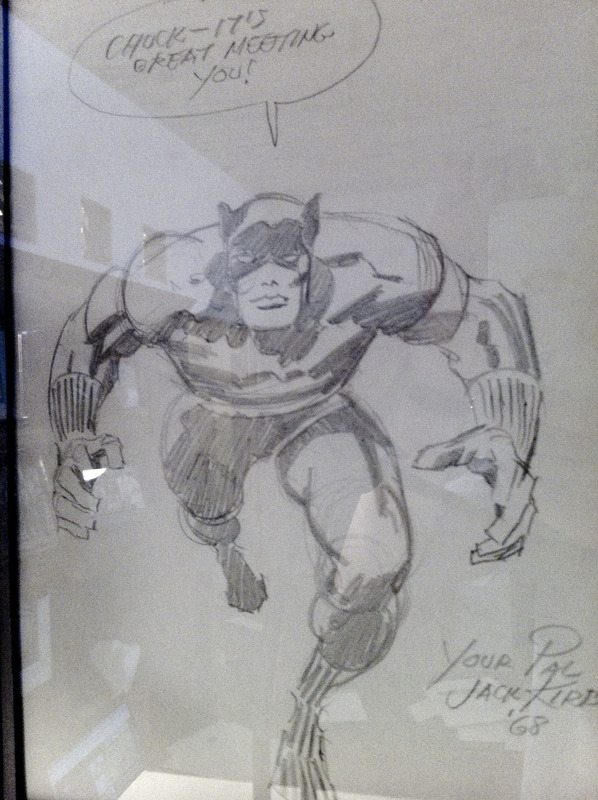 Black Panther pencil sketch drawn by Jack Kirby in his East Williston basement and given to Chuck Greaves in 1968. Snapshot of the art in frame behind glass. Today, almost 45 years later, I still look at both drawings every day, since they hang on the wall of my home office. They’re totems, I suppose; paeans to innocence in turbulent times. And they’re tributes to a man whose genius continues, even in these trying times, to offer the same promise of magic and adventure to a new generation. Jack Kirby, born Jacob Kurtzberg, died in Thousand Oaks, California in 1994. He was 76 years young. Jack, it was great meeting you.